To correct jowls and wattles for a more defined jaw, smoother neck and contoured cheek. Also known as rhytidectomy. Incisions are made starting at the temple, move around the ear and then are hidden behind the ear and in the hair. Skin is lifted and the underlying muscles and connective tissues are tightened and secured. Excess skin is removed. A facelift improves the appearance of the face by correcting deep wrinkles or folds, removing excess fat and loose skin at the jawline and neck, adding definition to the cheeks and re-contouring the chin. Alternatives include a minilift or a standard lift to achieve the results they desire depending upon the degree of age -related changes that are present. 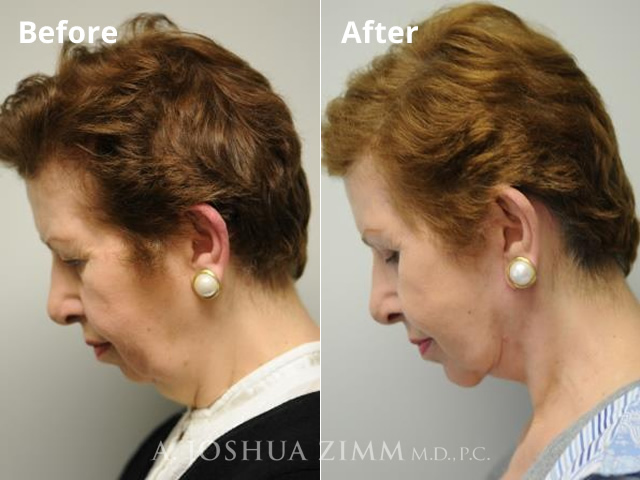 Neck liposuction and tightening of neck muscles can also be done at the same time if indicated. A facelift will not stop the aging process, improve fine wrinkles or pigmentation problems, or completely remove deep wrinkles and skin folds. Skin elasticity, thickness, texture and color. Underlying bone structure, including the desirability of chin or cheek augmentations to enhance structural facial definition. Adjunctive procedures such as laser resurfacing, injectable filler, or BOTOX cosmetic injections. Chin and cheek augmentation, or liposuction, are usually performed first if indicated. Surgery is typically performed at Manhattan Eye, Ear, and Throat Hospital under general anesthetic. Facelift patients are usually discharged the next day after spending the night in a hotel with an overnight nurse. Recovery time is usually 2 to 3 weeks.